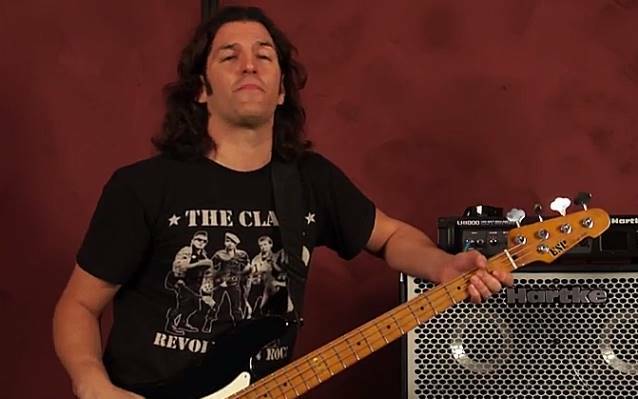 Bad Feeling Magazine recently conducted an interview with ANTHRAX bassist Frank Bello. An excerpt from the chat follows below. Bad Feeling Magazine: How is the new ANTHRAX album coming along? Frank: Well, I just finished my bass tracks, which is wonderful. The rhythm tracks are pretty much done. Joey's [Belladonna] killing it on vocals right now. Our lead guitar player, Jon Donais [SHADOWS FALL], his leads are almost done. I think he has three or four songs to complete. But we're chugging along. We wrote about 17 songs for this record, which is more than we've ever done. So there was a good amount to choose from. It just happened that way; we just kept going, because it just felt right. It's going to be difficult to choose. There's some really killer stuff, and it's going to be hard to choose which [songs] to go forward with on the record, and which ones to keep back for something else. Just seeing them all come to life, and when we put the cherry on top with Joey's vocals, man… You're working towards this goal, because you know what it can sound like, and when it all comes together, there's so much satisfaction. I'm a fan of this music, so it's great when we write the songs, and when you hear it come to fruition. And these aren't even the mixes; these are just the rough mixes. I'm pretty stoked. There's a lot of energy. Bad Feeling Magazine: A lot of people saw the last album, "Worship Music", as a return to the classic ANTHRAX sound. Is the new album going to follow that path? Frank: You know, I just think we are in a groove. All I can do is be honest with you. I feel like we've taken that next step. Everybody has to promote their record when they have a new record out, but I can just speak as a fan. I'm very proud of what we're doing right now. It's a bit thrashier than the last record. That's the best way I can describe it. There's some songs that are a bit thrashy, but I think there's a great mix of heaviness and melody, because we also have Joey Beladonna singing. The thing that I've always cherished about ANTHRAX is — I'm in the band but I'm still a fan — is that we have this heavy music, with this great melodic stuff on top with the vocals, so I think it's a really nice balance. I'm really psyched to play this stuff, you know what I mean? I'm excited to play it on stage, and just getting into it again. I'm looking forward to the new album cycle. Read the entire interview at Bad Feeling Magazine.